Overton Park is a 2 1/2 acre redevelopment project. 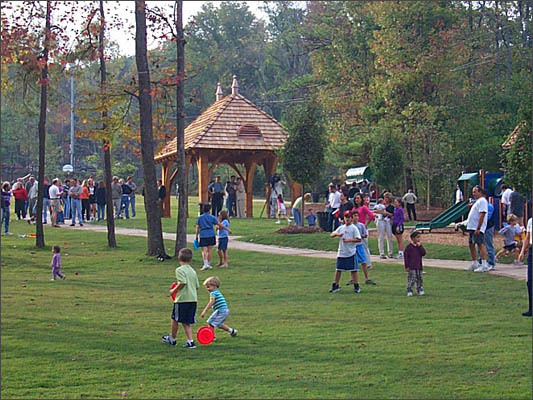 Working closely with the Mountain Brook Parks and Recreation Board and the Overton Neighborhood Association, great effort was taken to develop a park to meet the growing needs of this community. Originally, the tennis courts and parking areas split the park in half and created inefficient use of a valuable open space. The tennis courts, basketball goals, and play area were relocated toward the back of the property to make room for a large lawn and walking trail. This lawn, along with a new pavilion and entry gate, provides the perception of a much larger and more attractive park when viewed from Overton Road. Parking areas were also reorganized to be more efficient and remove a large amount of unnecessary paving.